In another bowl mix 1 cup milk, 1 tbsp cocoa powder, 1 tbsp caster sugar and a few drops of vanilla essence. Microwave for 5 minutes, stopping to stir in between if it looks that the milk will boil over (or use a bigger bowl). Now add chinagrass to the bowl and microwave for another 5 minutes. Pour into shot glasses. Chill for half an hour, then leave in the fridge to cool for a few hours. Garnish with a cherry or grated chocolate. But do not, like me, try to make it pretty before the pudding sets. One of my cherries sank, and the other one barely stayed on top. So wait for a couple of hours and garnish just before you eat! 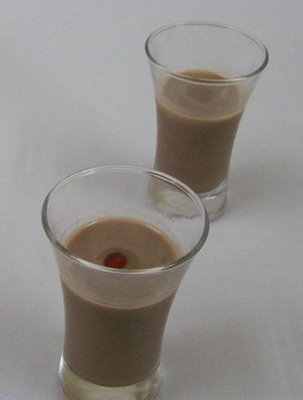 Simran, this is a wonderful drink...sweet and chocolaty! Nice chocolatey drink...So waiting to see more of your dishes coming out of MW. That looks wonderful!..thanks for the entry simran! Congrats on your new microwave..Lovely recipe with agar agar,,,have to try it!! this looks so yum,..nice shot,..
Yah! A new kitchen tool! Chocolate shots sound exciting!